It has been a very busy morning making easter nests . Firstly, we broke the chocolate so it would melt easily . Then we noticed this made the chocolate go all ‘smooth’ and very hot. Next, we were very careful when adding the shredded wheat. Finally, we spooned the mixture into paper cases and each child decorated their own nest. Today in the toddler room the children were baking gingerbread houses. Firstly, they weighed out the ingredients to make the gingerbread. Everyone loved the smell of the ginger and the nutmeg!! “It smells spicey!” We enjoyed mixing all the ingredients together in the bowl and poured it into the baking trays. Once the gingerbread was ready the children used their concentration skills to decorate the house using icing, adding sprinkles and sweeties! We had a taste at snack time at said it was YUMMY!! Irish Soda Bread For St. Patrick’s Day! Today the children have been learning about St. Patrick and how we celebrate his special day on the 17th of March. We decided to make some Irish food to try and decided to make some Irish soda bread. 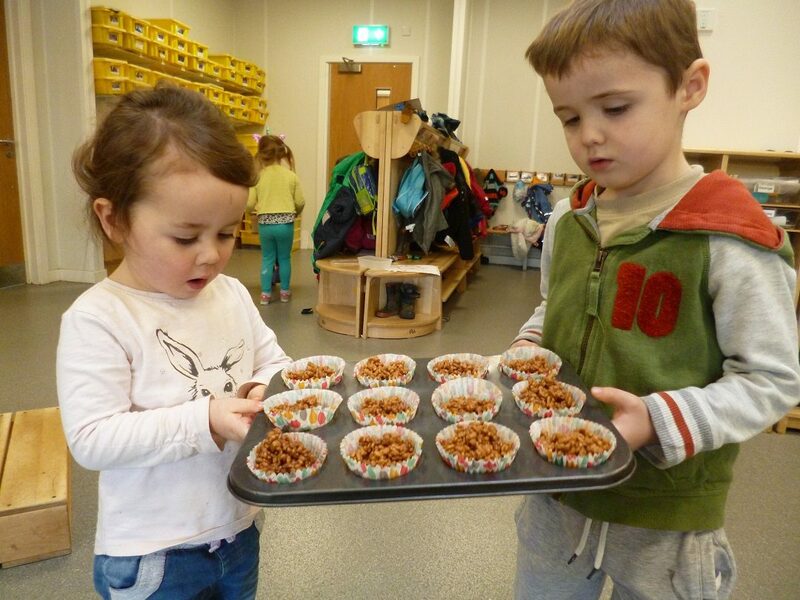 This gave the children opportunities to learn different baking methods. “I’m measuring out the flour”. “i’m going to get the right amount on this spoon”. “I’m good at kneading the bread”. The children have been enjoying the gingerbread man story and today they have baked their own gingerbread men. They enjoyed measuring and weighing all the ingredients and giving it a good mix. They then used the cutters to make the shape and placed them on the baking tray to go in the oven. Everyone is looking forward to decorating and taking them home tomorrow. This week the children have been talking about the gingerbread man. We read the story and the children decided that they wanted to bake their own. We looked on the computer for the recipe and together we chose the perfect one. The children enjoyed creating their own gingerbread men. We started off by measuring out the ingredients. We then combined them all together in a bowl and mixed them. We then measured out the perfect amount of butter. Once we had made a dough we rolled it out flat. Once our gingerbread men were cooked and had cooled down, we decorated them. Today the children enjoyed making some chocolate brownies. The children were exploring the numbers on the scales through discussions with their peers and started to predict how much butter they would need to use to get the correct consistency to bake our brownies. This week the children are busy singing their Christmas carols for their concert on Thursday. In the home corner we have been making green glitter playdough with tinsel hidden inside which was the children’s idea. 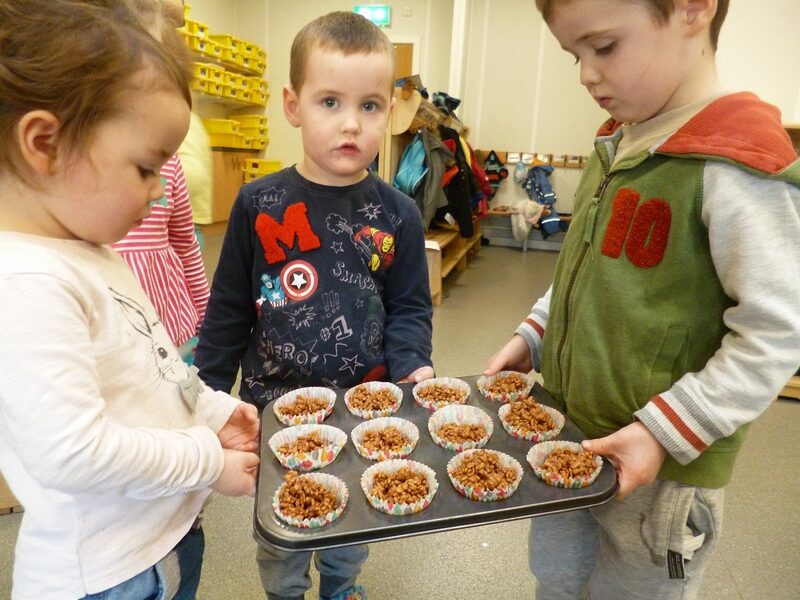 Also the children wanted to make chocolate crispies and they made them with rice snaps and milk chocolate-‘Yummy’. With St Andrew’s Day looming, we have been looking at our Scottish heritage and what could be more Scottish than shortbread? The children loved mixing the butter, sugar and flour together before rolling it out and cutting it into perfect shortbread rounds. No matter what the weather, Cart Mill’s garden is always a busy, productive place to be! We have had lots of fun today exploring paint in a different way. We used different sizes of brushes and lots of different colours. We have also been busy baking fairy cakes. The children used various kitchen utencils and were able to follow the instructions from Angela.